Give up all your unrealistic expectation about marriage being this beautiful box full of all the things you have always longed for and see marriage for what it truly is – an empty box where you and your partner MUST put all the things you want to take out. Accept that if you want to have love in your marriage, you have to put it there. If you want to have happiness, passion, intimacy, companionship, trust in your marriage, you have to put it there. 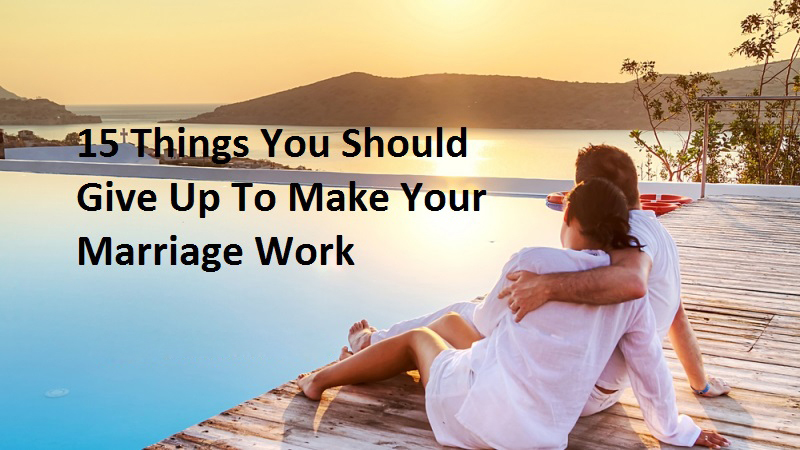 Relationships take work, a lot of work and if you want to live a happy, beautiful and loving life next to your partner, you will both commit to making your marriage work. Always remember, relationships don’t work unless you do. People are made to be loved, not controlled. The more you try to control your partner, the more you will push him or her away from you and the less love there will be left between you two. Give up control and allow the ONE you love to just be. Allow the person you love to be who they are and not who you want them to be. No matter how long you two have been together and no matter if you are married and have 10 children together or not, you do not posses your partner. He/she is not your propriety. You both are two separate entities and just as you are separate from him, so is she separate from you. Give up possessiveness and allow your partner to breathe. Give him/ her the space and freedom they truly deserve and watch how much more beautiful your relationship becomes. Give up the need to criticize every little thing your partner does or doesn’t do and instead start appreciating those many things that made you fall in love with this person in the first place. Seek to praise not to criticize. Keep in mind that you attract more bees with honey than you do with vinegar. Relationships aren’t about fixing one another, relationships are about loving, caring and supporting one another. You might think it’s your responsibility to “save” and “fix” your partner but trust me, that’s not really the case. Give up the need to fix your partner and work on growing, improving and evolving together instead. The root cause of jealousy is insecurity. Work on letting go of your insecurities and you will immediately understand the futility of a jealous behavior. You will immediately give jealousy up. Give up the fear of cheating on one another, the fear of falling out of love, the fear of having your present relationship become as toxic as the previous ones and so on. Get out of your fearful head and into your loving heart. Give up on all your fears and love with all your heart. What screws us up the most is this idea we have in our heads about how relationships should be like and how our partners should behave. Instead of savoring, loving and praising one another, nurturing the relationships we have, we waste our precious time and energy seeking perfection, in ourselves, in our partner There’s no such thing as perfect relationships simply because there’s no such thing as perfect people. Your marriage is and always will be a reflection of who and your partner are – two perfectly imperfect people. Believe it or not, it’s not the other person’s job to make you feel all the things that you yourself can’t feel on your own. It’s not the other person’s job to make you feel loved, happy and whole when you yourself feel unworthy, unhappy and incomplete. That’s not their job, that’s your job. Give up the need to blame your partner for everything that goes wrong in your world, for why you aren’t feeling as loved and as happy as you would like to feel and start taking ownership for your own thoughts and feelings. Remember when you and your partner first started dating? Remember how beautiful and how lovingly you spoke to one another? Back then you didn’t care whether you were right all the time or not. All that you cared about was to make the other person feel loved, appreciated and happy. So why change now? Give up the need to always be right and choose to be kind, loving and supportive instead. It’s true that relationships require compromise but when you compromise too often, living your life according to the other person’s expectations, you risk losing yourself and that’s how you start feeling bitter, depleted, frustrated and very unhappy. Don’t lose the “I” in playing the “We” game. Compromise when needed but not so much that you lose your sense of self. Balance is key. There’s nothing less attractive than a person who clings onto his/her partner expecting the other person to provide all their emotional, physical, and spiritual needs. Take the “pressure” off of your partner’s shoulders and put it on your shoulders instead. Seek to become the provider of your own their emotional, physical, and spiritual needs. Be the source of your own happiness. If you enter a relationship expecting to get a lot more than you give, chances are that you will have many marriage regrets. The only way a relationship will last is if you see your relationship as a place that you go to give, and not a place that you go to take. Give more, ask less. Make peace with your past. Make peace with your “stuff”. Don’t carry the heavy weights of your past with you into the present. If you want to build a happy, loving and healthy relationship, you have to start fresh, you have to leave your emotional baggage behind. There is a huge difference between love and attachment and what most people call “love” is nothing more than attachment. Attachment comes from a place of fear, while love is pure, kind, and selfless. Love is ready to detach and let go if the relationship between two people becomes toxic and detrimental to the healthy growth and evolution of both parties. Attachment on the other hand loves to hold onto toxicity, feeding itself with the pain and suffering of people. And these are the 15 things you should give up to make not only marriage work but also any romantic relationship. P.S. It’s very important to understand that some people, no matter how much they love one another and no matter how much they want to make their marriage work, might not be able to do so simply because they both learned the lessons they had to learn and now life calls them in different directions. To paraphrase Elizabeth Gilbert, soul mates, they might come into your life to reveal another layer of yourself to you, to help you see a part of you that you did not know was there, but when the work is done, they will leave, making room for something new, for something better to come your way. This is why it’s so important to listen to your heart and intuition and make sure that you don’t stay in a relationship that makes you feel dead on the inside simply because that’s what society and everyone around you expects you to do. Your peace of mind, health, happiness and wellbeing are more important than anything else. So stay happy!